We offer our clients with a wide gamut of qualitative Parallel Blade Dampers. These products are manufactured by making use of high-grade material, procured form the established vendors of the industry. Further, to cater to the diversified demands of the clients, we offer these dampers in different sizes and specifications. Our valued customers are presented with a qualitative Opposed Blade Dampers. These precisely designed opposed blade dampers allow unlimited airflow adjustment facility from any airflow panel. 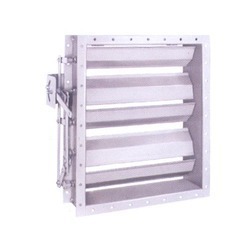 The offered products provide additional airflow than compared to other slide dampers. Moreover, we also provided these opposed blade dampers as per the clients requirements at a cost effective manner. 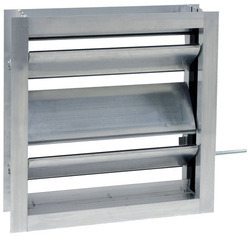 Parallel Blade- Parallel blade dampers are usually selected for volume control from wide open to 75% of wide open. A relatively large control arm swing provides sensitive control through a relatively small change in air volume. Parallel blade dampers also offer the best first-cost selection for simple open-closed damper requirements. Opposed Blade- Opposed blade dampers are selected for applications requiring volume control over a broad range, from wide open to 25% of wide open, as the control arm swing is more proportional to the dampered effect. We have been enlisted as a reliable company in manufacturing, supplying and trading of high quality Industrial Blade Dampers. 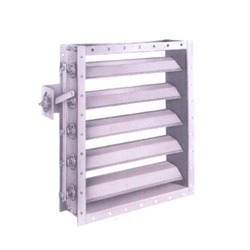 These Industrial Blade Dampers are manufactured by using fine quality material that is sourced from one of the most trusted and reputed vendors with the market. These precisely designed opposed blade dampers allow unlimited airflow adjustment facility from any airflow panel. 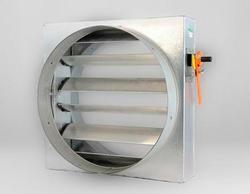 The offered products provide additional airflow than compared to other slide dampers. Moreover, we also provided these opposed blade dampers as per the clients requirements at a cost effective manner. Looking for Blade Dampers ?